With Readly you can read 100 Greatest Sci-Fi Characters of All Time and thousands of other magazines on your tablet and smartphone. Get access to all with just one subscription. New releases and back issues – all included. 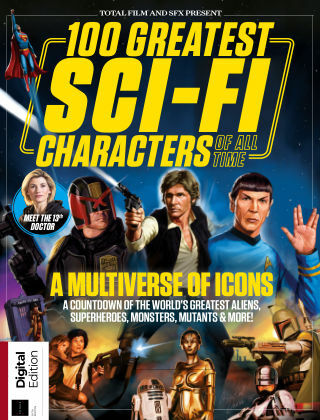 Welcome to the 100 Greatest Sci-Fi Characters Of All Time, from the makers of SFX and Total Film. You’re about to enter the ultimate personality clash. This is a Top 100, where talking cars are pitted against mutated men; where robot trucks jostle for the top position with alien superheroes; where cyborg killers battle it out with post-apocalyptic revolutionaries. So, what makes a great sci-fi character? It’s impossible to construct a formula. How do you compare a droid with a cop? A mutant with a supercomputer? Despite the mind-boggling list of characters the genre has to offer, certain names do crop up again when you ask sci-fi fans to name their favourites. While genre boundaries are always tricky to define, we tried as much as possible to stick with predominantly sci-fi characters, as opposed to predominantly fantasy characters. Sci-fi fans could argue these things for an eternity, but someone has to make the decision before then. Which is what we did.